Both Roseland shows were sold out. Photo by Lisa. I real­ize that most peo­ple have no idea who the hell MBV is, but I’ve wait­ed fif­teen years to see them per­form. Love­less was one of my favorite albums as a teenag­er – not only is that LP a mod­ern rock mas­ter­piece, but it also was the cen­ter­piece of the whole shoegaze scene in the ear­ly 90s. The band spent £200,000, about $366,000, on equip­ment for the tour, and Mr. Shields laughed when asked how many effects ped­als he owned. “Hun­dreds,” he said. He only uses 30 onstage, he added. I wouldn’t know what to do with 30 ped­als, let alone hun­dreds. But the result was incred­i­bly loud and lay­ered, but still very faith­ful to the albums. 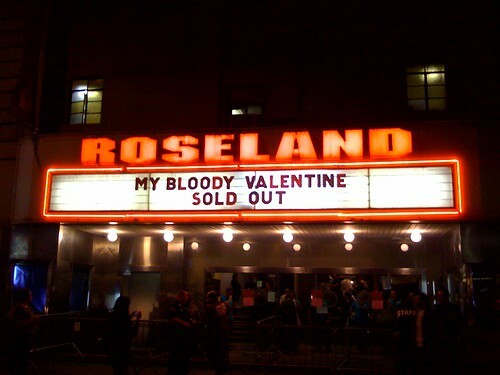 My Bloody Valentine performing “Soon” at Roseland Ballroom in New York City. Video by risekevin. We were so far in the back though, that I didn’t real­ize how stun­ning Belin­da Butch­er is these days… love­ly.